I asked Kelly from Travel with the Magic if she'd be interested in sponsoring a giveaway for our blogoversary and she said she would love to. Jump ahead a week or two and a HUGE box of Disney goodies was delivered to my door. So we'll have three grab bag giveaways. Ready to enter to win a variety of cool Disney merchandise? REQUIRED: Tell me which two of the following movies you prefer. This will help me put together your prize if you win. Toy Story, Tangled, Fantasia, and Nightmare Before Christmas. ~Tweet about this giveaway, one entry per day. This contest ends at midnight Eastern time on Thursday, April 28, 2011, and is limited to residents of the United States and Canada. The three winners will be chosen at random from all eligible entries. You'll be notified via email (so make sure I can reach you!) and have 48 hours to respond or another winner will be chosen. Good luck! There are still a few more hours to enter the giveaway for a copy of Lisa Battista's book, Beyond the Attractions : A Guide to Walt Disney World with Preschoolers. Click here to enter. I liked Travel with the Magic on FB. I followed Travel with the Magic on Twitter. And I was already following you on Twitter. I'm following you on Google Friend Finder. I tweeted it with a mention to your twitter address. tangled and toy story, but tickled to win any of them! I Like Growing Up Disney on Facebook too! I Tweeted about this giveaway @adisneymom. Toy Story and Fantasia for us! I already like Travel with the Magic on Facebook! I am now following Travel with the Magic on Twitter! I am following you through GFC! I like all of these movies, but prefer Toy Story and Tangled the most. I like Growing Up Disney on Facebook. I like Travel with the Magic on Facebook. I would love to win Toy Story and Tangled. Hi! i;m a follow of your blog! Love Tangled!!! I am following Travel with the Magic on Twitter! I am following Growing Up Disney on Twitter! Hello again! I Twittered about the contest!! Blogged about it today! www.thewriterscocoon.blogspot.com- goes perfectly with today's A-Z Blogging challenge post!! And I forgot to add my email in the above posts! OOps!! Toy Story, Tangled - favorites at our house!! I follow Travel with the Magic on FB. I follow Travel with the Magic on Twitter. I follow Growing Up Disney on Twitter. I like Growing Up Disney on FB. Fantasia and Toy Story are great! Following Travel With The Magic on Twitter! I like Travel with the Magic on Facebook! 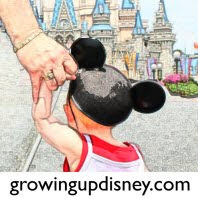 I like Growing Up Disney Blog on Facebook! I follow Travel with the Magic @TravelwtheMagic on Facebook! I follow Growing Up disney @Disney4Babies on Twitter. I retweeted about the Travel with the Magic giveaway today. My favorite Disney movies are Tangled and Toy Story. I follow Growing Up disney publically on Google Friend Connect! We love Fantasia and Nightmare before Christmas! I "like" Growing Up Disney on FB! My two are Toy Story and Tangled! Toy Story and Tangled would be my two favs! Tangled and Toy Story! :) I am a fan of Growing up Disney on facebook! I found you from Sippy Cup Mom and my girls are on a HUGE Tangled kick right now. I "liked" your blog on FB. I prefer Tangled and Nightmare Before Christmas. I "Like" Travel with Magic on Facebook. I prefer Tangled and Toy Story! our favorite movie from those is def Toy Story!